Who Do You Think Was Spotted Driving This Awesome Gray LaFerrari? 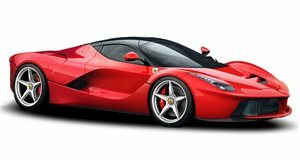 The LaFerrari is one of the only cars in the world that can make supercars look like little boys' cars. That's because the LaFerrari is, quite simply, on another level. One of the main things that sets this hypercar apart is its hybrid powerplant that pairs electric motors to a 6.3 liter V12 for a total of 950 hp and 664 lb-ft of torque. The look, the sound and the performance of Ferrari’s top dog truly puts the rare hypercar in a class all its own. Ferrari only allows the most prestigious of buyers to get the keys to a LaFerrari. And one of those lucky owners is none other than the Devil himself, Hell’s Kitchen host, Chef Gordon Ramsay. Ramsay is a known Ferrari fanatic and it clearly appears that his good taste is not just limited to food. The LaFerrari could easily be considered the filet mignon of Ferraris and the Grigio Medio paint scheme is an impeccable color on the ferocious vehicle.